Virgin’s plans for Flybe revealed in the official scheme document – and which brand will be used? HFP readers in the City may be interested in the formal scheme document for the sale of Flybe to a Virgin Atlantic-led consortium which was published yesterday. You can download it here (PDF). Note that all bolding in this article is mine and does not appear in the original document. Sale completion is still expected by the long-stop date of 22nd February. operating the Combined Group as an independent company, and optimising the combined commercial, operational and functional expertise and scale of Virgin Atlantic and the Stobart Group. 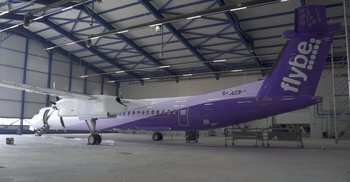 Connect Airways plans to optimise Flybe Limited’s network and operations to focus on key routes with the aim of continuing to enhance regional connectivity across the UK and Ireland. Connect Airways also intends to bring benefits for customers through linking an enhanced Flybe regional network with Virgin Atlantic’s long-haul operations particularly at Manchester Airport and London Heathrow Airport. All flying operations except Stobart Air will operate under a Virgin brand to the extent possible. This will be timed to coincide with a refurbishment programme for Flybe Limited’s fleet to provide a seamless customer experience in keeping with Virgin Atlantic’s heritage. This is where it gets interesting, I think. It was originally announced that the airline would be rebranded as Virgin Atlantic. I thought this was not incredibly smart, because with the best will in the world it is impossible to bring much of the Virgin ‘sparkle’ to short-haul flights on tiny aircraft. There is one reference to the fact that the Virgin Atlantic brand will be used. However, there is another reference to “a Virgin brand” being used – which logically may not necessarily be Virgin Atlantic. Perhaps Virgin Little Red (see the mock-up branding above from a few years ago) will return! Let’s see. Slightly off topic, but related. My regular Avios.com account has now been closed; last week I flew BHX – GLA with Flybe. Where do my Avios go ? There was a double Avios promo on. As it happens, I only had 1 solitary Avios in my account, as I had regularly been “combining” them. What happens to it ? Also, if I was to collect regular Avios via e-rewards or Rewards for thoughts (as I used to do), where do they go ? Nothing has appeared in my BAEC as yet, over a week now. I spoke to them about this. The Flybe Avios will end up in your Avios.com account, and they say they are doing regular sweeps of the closed accounts to move things across to your BAEC account. In my case, that is a second BA account they erroneously set up for me, so the transfer will in turn be merged into my normal BAEC balance. In theory…! Don’t expect the Avios from your Flybe flight to turn up any time soon though, normally takes about a month. You can always phone them up, the person I spoke to at Avios.com was very helpful and could see all the activity (and the orphaned Avios) on my ‘closed’ account. Lovely, thanks for update. Both erewards and rewards for thoughts said I would be able to link their rewards to BAEC Avios, but not seen any evidence of that yet. VS-related: Someone on FT has posted that VS will start flying to TLV/Tel Aviv from September. I have had some info seemingly confirming this too. OT : Iberia swapped planes yesterday on IB3166 from an A340 to A350 Madrid Heathrow. Screen was very good in business but didn’t like my seat 8J too close to the seat the other side of the aisle, the row 7 widow seat would have been a lot more private….. Thanks for the pointless information. Slightly O/T but I’ve seen speculation that Virgin might be candidates to take on some or all of Thomas Cook – any thoughts? A lot of it is Condor in Germany which they won’t want. 45% of passengers on Thomas Cook are going on a Thomas Cook package holiday and 25% are on other package holidays. Only 30% of seats are sold direct. This doesn’t make it hugely attractive. Virgin wants them out of the way at Manchester but I doubt it wants to buy them. It’d be a shame if Thomas Cook airlines go, they are one of the few that properly cater for a gluten free diet. Avios are “sweeping” from avios.com to BAEC on a semi-regular basis. It seems to work. Utter rubbish John, I have two Lloyds 241 vouchers in my account just now. You need to brush up on the old versions of the Lloyds cards. Join Aer Club. Keep a handful of points in Avios.com. Avios.com retains full functionality. I can see my upgrade vouchers, and recently booked a flight using one of them. How flexible is Virgin Atlantic’s licence to use the Virgin brand? Would they have to always use the Atlantic part of their name (as their previous UK domestic operation’s logo shows “Virgin Atlantic Little Red”, not “Virgin Little Red”)? If “Little Red” used A320s should the flybe fleet not be called “Tiny Red”? Do they get to ditch any liabilities as part of the deal? I was under the impression that they deeply regretted the price they paid on the Embraer leases. One has gone and anther has been renegotiated, looking at the docs. That is most of the problem dealt with.